So when I read Mr. Jarche’s narrations of his work and learning I get it, I love it, I applaude it and in my own corner of my first world country I am still not seeing it in the work place. I see it online, a lot, but not in place based work environments. How many people use network technology to network? 50% of the population currently uses Facebook, and more than 37% use Twitter. Yet among Fortune 500 CEOs, the report says, only 7.6% are present on Facebook, only 4% use Twitter, and less than 1% use Google Plus. LinkedIn is the only social network where CEOs are slightly ahead of the general populace, the study concludes: Twenty-six percent of CEOs surveyed use LinkedIn, compared to 20.15% of the population at large. So you may be thinking that I must work in a field that is comprised of non-professionals. Not so. I have a couple of official jobs and volunteer positions and all put me in direct contact with professional types. I am a health manager for four First Nations communities, I blog for a tech start up and I am on the board of a non-profit. Lets unpack the PKM and real technological use of each of these. I helped create the communication toolkit for the First Nation Health Council’s Community Engagement Hubs. I have to say that the First Nations Health Council and the Interim First Nations Health Authority are perhaps the most transparent and forward thinking organization I have ever worked with. They embraced social media and networked approaches right from the beginning. However, this is not a reflection of how the rest of the varied Aboriginal populations in BC work. Many First Nations communities do not have stable internet connections. I work in the Fraser Canyon and I can say for certain that there are days and sometimes weeks that my office has no internet and at times no phone connection. And that’s only a couple of hours outside of Vancouver. Beautiful and rugged terrain with low populations has a price. In these areas, where connectivity is sparse, inconsistent and s l o w people have not adopted the use of the internet, never mind developing a PKM strategy outside of their immediate family. I currently have several very professional staff who do not have email.. at all. My weekly sharing of what I learned this week (I narrate everything) always has a subject line that says “PRINT THIS FOR….”. This makes sense. Why would you adopt something you can’t access consistently. The other side of this is that many Aboriginal communities and individual do have access and in fact were early adopters of technology. There is digital divide and there is an addition digital divide within communities. Some of this is due to connectivity challenges and some id due to socio-economics. Poor people, and Aboriginal folks lead the pack in the low income race, may have access to technology but its not easy access. There are barriers. Many, many barriers. That lack of access means low familiarity and until you get to the point where you are comfortable in the environment you are not likely to move into advanced use like using technology to grow a PLN. I love coders. They are a special group and I admire their collective ability to understand all that… code stuff. I can manage “Hello World” but that’s about it. Thank you WordPress and WYSIWYG editors! Coders do not blog. Coders do not read blogs. Coders do not partake in Twitter, Facebook, LinkedIn (unless you beg them to put up a profile so your company looks like it really does have staff). I know some do, most don’t. They do narrate their work for other coders but it’s not the kind of narration of work we are talking about here. There is no associated introspection around how this or that particular line of code made them feel or how it will change the world.. unless they are writing code for a game.. different story there… Many do use their own niche social networks like message boards to get help with problems or support others with work related challenges but not in the way we think of as networked learning. Same for graphic artists and other creative brainiac types. This is not a blanket statement based on fact, more of an observation. I know a lot of computer programmers, graphic artists and scary smart people. Many game, they don’t Tweet. If they use the internet at all away from work its for pleasure not for learning. If they use it for learning at work its with surgical like precision. I think it seems like they rule the social media space because the ones that are networking online do it really, really well. We all listen to them and the quality of their sharing makes it seem “as if” all technocrats frequente the online world that we think of as PLEs. Oh dear, board members, please check your email more than once a week. Please wake up to the potential of sharing your ideas, successes and challenges in an open, networked environment. This week I received several really interesting emails about learning opportunities for and by non-profits. Not a single one included an easy way to share the information. What I got was a pdf poster attached to an email. (insert really long drawn out sigh here). Again, many NPOs are brilliant at social media, social networking online, building capacity by narrating their work. yada, yada, yada.. and most are not. I sit on one board of 10 people with a support person and an executive director and not a single one uses Twitter or LinkedIn. Two do use Facebook but that is a recent adoption for them. None blog or read blogs, most have no idea what a blog is. Unbelievably the Facebook page I set up for them has a growing list of page Likes and is proving to be really useful .They are “getting” Facebook but are miles away from “getting” the value of a PKE, PKN or PKM. What makes that ok is that so are the majority of people. 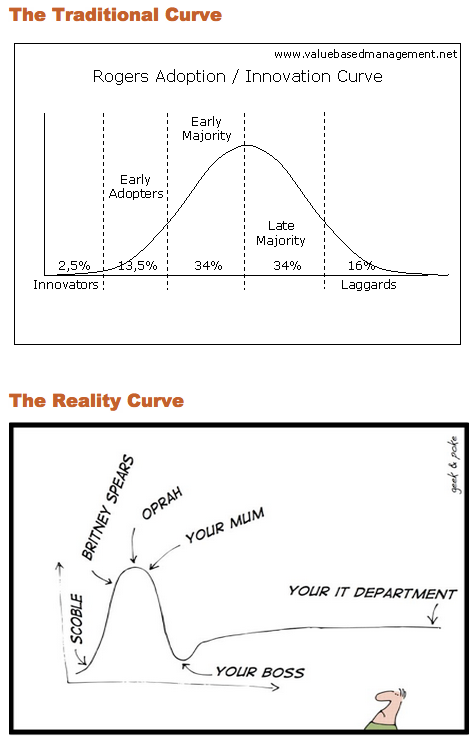 Where are we on the adoption of innovation curve? I am not sure but I suspect that we are not nearly as far along as we think we are. Those at the bleeding edge have a perspective not shared by the majority. Lee Smallwood (@leesmallwood on Twitter) explains this best on his blog by sharing the two graphics below. So I’m a little envious of companies and organizations that can ask those kinds of question now. “Show me your wirearchy” will no doubt be part of the future interview, which will probably not be face to face.. We aren’t there yet. I hope we get there soon.